Does your investment portfolio consist only of stocks and bonds? According to investment experts, it is not a wise decision to put all your apples in one basket. Diversifying your portfolio can offer added protection against fluctuations in the value of any single asset or group of assets. Consider investing in precious metals like gold and silver to diversify your portfolio and reap benefits for a lifetime. Currently, precious metals are on a boom. Read on to know the advantages of investing in gold and silver. For centuries, gold has been considered a symbol of security & prosperity. Indians buy or present gold extensively on important occasions, be it a wedding or some religious festival. It is considered to be one of the safest forms of storing wealth. These aspects of Indian culture has made India the world's largest consumer of gold. (Source: World Gold Council). 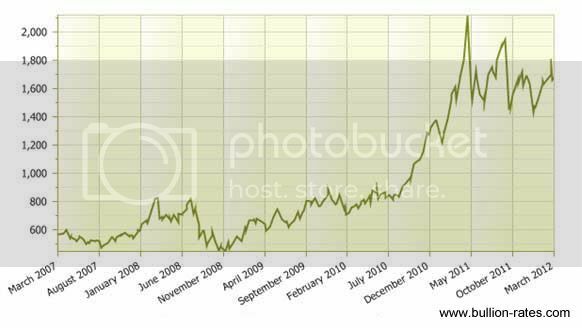 Growth: Have a look at the 5-year price spurt of gold. The price of gold has consistently been rising up and touched an all time high many times over the past few months. There is great likelihood that its value will continue to increase. Demand and Supply: Demand for gold has shown sustained growth recently, partly due to rising income levels in key markets. However, the supply falls short by a substantial percentage. These supply and demand factors have laid foundations for gold’s most positive outlook in recent times. Less Risk: Gold is significantly less volatile than most commodities and many equity indices. Assets with low volatility help reduce overall risk in your portfolio, and make an ideal investment for all times. Stability: The market goes through many ups and downs with price fluctuations but over the long term, the value of gold keeps going up. Gold also acts as a hedge against fluctuations in currency that makes it the safest bet for investment. Worldwide Acceptance: Gold is easy to buy, sell and exchange anywhere in the world. Freedom to convert: Pure gold coins can be used to make jewellery through your family jeweller or can be exchanged to buy jewellery from any jeweller. And, last but not the least, gold is the perfect treasure to pass on from generation to generation to make it a valuable tradition. Silver is not only valued for making jewellery but also for increasing demand in industrial purposes. Growth: Have a look at the 5-year price chart of Silver. Consistently the price of silver has been rising up and touched an all time high many times over the past few months. There is great likelihood that its value will continue to increase. Fits your Budget: Silver is a risk-free investment option for first time investors and micro investors who can afford to spend a minor part of their income to secure their future. Rising Demand: Silver is not only used for jewellery but also gaining importance as a vital metal for medical and other industrial purposes. Along with being deemed a safe investment, the relatively low supply of the metal as compared to the high demand has also contributed to the steady increase in price. Hedge against inflation: Silver has always been a solid investment option for the same reason as gold, that it is significantly less volatile than most commodities and many equity indices. As the precious metal market keeps establishing newer heights, the right time to invest is now. You can choose to invest either in 22kt or 24kt gold coins and silver coins based on what suits your pocket. Generally, all types on investments will reap high returns in the long-term. So, make the decision to invest today and secure your child’s future apart from enjoying a glittering retirement!